We are on the final countdown – just one week from tomorrow, and the school year will officially be over. There is part of me that feels like this year absolutely flew by, then another part that has been waiting forever for the year to be over. Of course it will definitely be bittersweet – with my older daughter having to change schools next year leaving the majority of her friends. My goal this summer is to have a more positive outlook on the whole situation. The good news is we found out the new school will not only have an orchestra next year, it will have four! Of course her old school has five, but who is counting. And even though the building is old and it will take them a few years to make the changes they are hoping for – by the time my younger daughter is there, things should be in much better shape. The other weekend was my older daughter’s birthday. When I asked her what she wanted me to make, she really had to think hard – but she kept bringing up the Boston Cream Pie I had made for her last year. She knows how I like to try new things though, and was really torn. 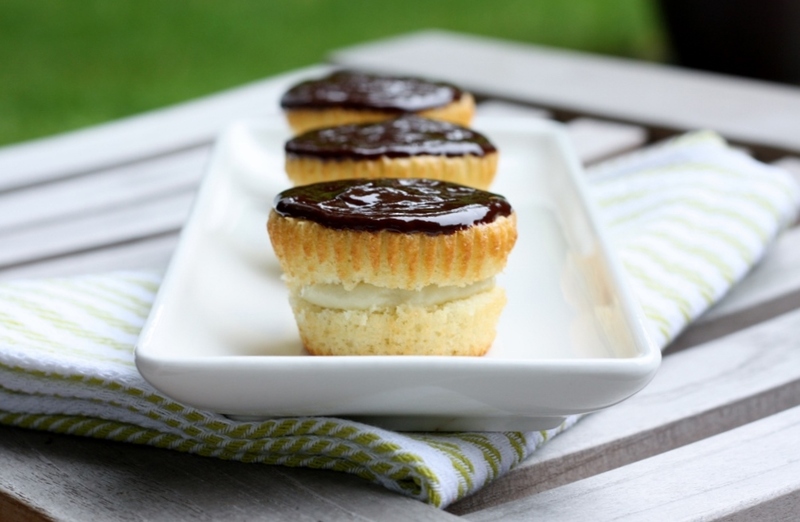 That’s when I had a great idea – what if I could turn the Boston Cream Pie into cupcakes?? She was sold – hands down. And then I hit myself – seriously, am I going completely mad? The Boston Cream Pie was hard enough, and now I was going to try this again with cupcakes? I am a glutton for punishment – that tastes absolutely incredible at the end. These cupcakes were fabulous. They were everything that the cake was, and more – because they were so ridiculously adorable. Second time around is much easier than the first, and they actually didn’t take too long to make. Particularly because I made the custard the night before. Don’t fret if you have leftover custard like I did – I just put it into some small ramekins, and the girls ate it like pudding – the most decadent and creamy pudding ever. Watching my daughter eat these cupcakes with her friends – and the happiness in the air – it was perfect. They were able to forget all about the changes coming – and just focus on the positives. A good lesson for us all to remember. Focus on the cupcakes…and nothing else matters. Heat the half-and-half in a medium saucepan over medium heat until it just simmers. In another bowl, whisk the egg yolks, sugar and salt until smooth. Add the flour to the yolk mixture and whisk until incorporated. Remove the half-and-half from heat and, whisking constantly, slowly add 1/2 cup to the yolk mixture to temper. Whisking constantly, return tempered yolk mixture to half-and-half in saucepan. Return saucepan to medium heat and cook, whisking constantly, until mixture thickens slightly, about 1 minute. Reduce heat to medium-low and continue to simmer, whisking constantly, 8 minutes. Increase heat to medium and cook, whisking vigorously, until bubbles burst on surface, 1 to 2 minutes. Remove saucepan from heat, whisk in butter and vanilla until butter is melted and incorporated. Strain pastry cream through fine-mesh strainer set over medium bowl. Press lightly greased parchment paper directly on surface and refrigerate until set, at least 2 hours and up to 24 hours. Adjust oven rack to middle position and heat oven to 325 degrees. Lightly grease 2 cupcake trays (24 total) or place non-stick wrappers in the cups. Whisk flour, baking powder, and salt together in medium bowl Heat milk and butter in small saucepan over low heat until butter is melted. Remove from heat, add vanilla and cover to keep warm. In stand mixer fitted with whisk attachment, whisk eggs and sugar at high speed until light and airy, about 5 minutes. Remove mixer bowl from stand. Add hot milk mixture and whisk by hand until incorporated. Add dry ingredients and whisk until incorporated. Working quickly, divide batter evenly between the 24 cups – they should be about 3/4 full. Bake until tops are light brown and toothpick inserted in center of cakes comes out clean, 18 to 20 minutes. Transfer to wire rack and cool completely in pan. Carefully remove them from the papers or the tins. Cut each cupcake in half. Whisk pastry cream briefly, then spoon on tablespoon of cream onto each cupcake bottom. Using offset spatula, spread evenly to cake edge. Place the top of the cupcake over the cream, making layers line up properly. Refrigerate cupcakes while preparing glaze. Bring cream and corn syrup to simmer in small saucepan over medium heat. Remove fro heat and add chocolate. Whisk occasionally, until thickened slightly, about 5 minutes. Pour glaze onto each cupcake. Use offset spatula to spread glaze to edge of cake. Chill cupcakes 3 hours before serving. Cupcake may be made up to 24 hours before serving. I am gearing up for real life…and am a little bit in denial right now. I feel like when my alarm goes off tomorrow, it will feel like I am participating in the Polar Bear Plunge. Nothing like a good wake up call for the new year. I am embarrassed to say that I am finally getting around to posting the cupcakes I made for my younger daughter’s birthday party this year. If you remember, she requested these for her actual birthday – making sure that they had nothing to do with any type of Thanksgiving dessert. But she wanted something pretty mainstream for her party – but boy were they delicious. This week was my birthday – I am not sure when, but at some point, I really stopped looking forward to my birthday. Once you have kids – your birthday is really just an excuse for them to pick out a cake for you. So this year I decided to do something a little different. The girls were still off from school – and I was not back at work yet. As you can tell – I am pretty into food – particularly baked goods – and I do a lot of reading about the hottest new bakeries in the city. Unfortunately I don’t get a lot of time to visit them – and most of the time I would rather make my own treats. Except on my birthday. In the past I have been known to make my own cake – but this year I came up with a better plan. I decided we would visit four local bakeries that we had not been to – sample some stuff while we were there, then bring home goodies for later. They were all outstanding in different ways. Holy Cannoli had some delicious Stromboli’s – we thoroughly enjoyed them. The cannoli’s were pretty darn good as well. Fuji Bakery was like a cross between a Japanese and French bakery – we had a great bacon roll but their cinnamon bun was the winner. At Crumble and Flake, they didn’t have a ton of selection, but the pain of chocolate took me right back to Paris – completely authentic. Last but not least was Bakery Nouveau – where we sampled some of their pizza’s and I had a veggie sandwich. Their baked goods looked outstanding, but I needed some healthy food at that point. I will definitely be back. So there you have it – what a great day. Now I leave you with my baked goods. 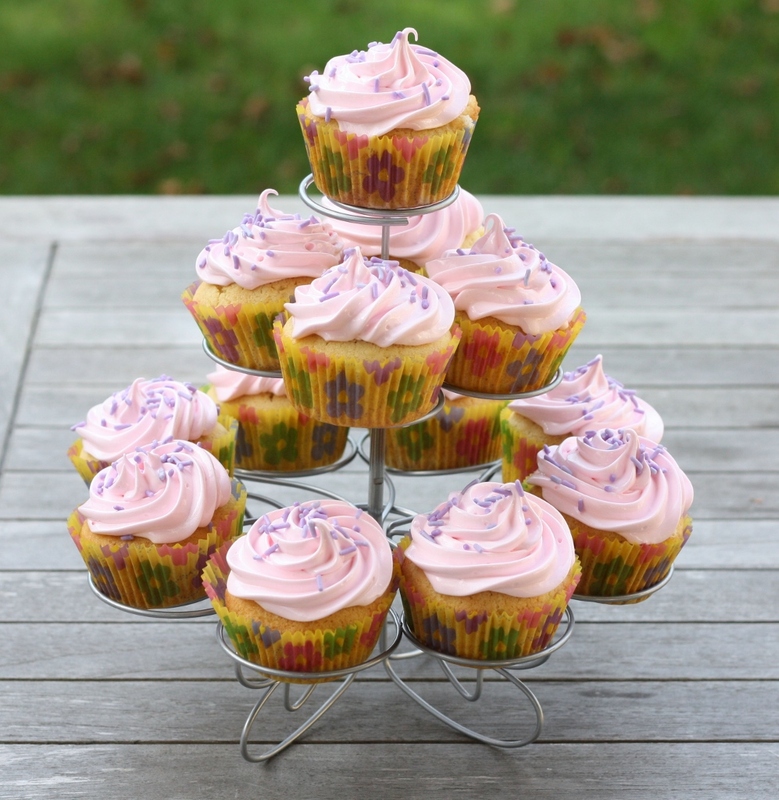 I found the Vanilla Cupcakes on the blog SugarCooking – which I only changed slightly. The recipe actually was adapted from “Baking: From my Home to Yours” – by Dorie Greenspan. The frosting, well I used my favorite Marshmallow Frosting, and they made a perfect pair. Center a rack in the oven and pre-heat the oven to 350 degrees F. Line cupcake pans with paper liners. Beat together the butter and sugar at medium speed for a full 3 minutes, until the butter and sugar are very light. Beat in the extract, then add one-third of the flour mixture, still beating on medium speed. Beat in half of the milk-egg mixture, then beat in half of the remaining dry ingredients until incorporated. Add the rest of the milk and eggs, beating until the batter is homogeneous, then add the last of the dry ingredients. Finally, give the batter a good 2-minute beating to ensure that it is thoroughly mixed and will aerated. Fill each cupcake 3/4 full. Bake for 18 to 22 minutes, or until the cupcakes are well risen and springy to the touch- a thin knife inserted into the centers should come out clean. Transfer the cakes to cooling racks and cool. To make the frosting, bring 1 inch of water to a simmer in a medium saucepan. Combine the egg whites, sugar, corn syrup, water, and cream of tartar in a large bowl. Set the bowl over the simmering water, making sure the bottom of the bowl doesn’t touch the water. With an electric mixer on high-speed, beat the mixture, still over the simmering water, until thick and fluffy, about 7 minutes. Beat in the vanilla extract. Serve this the day it is made as it becomes granular if it sits. My grandmother was 100% goodness. There is really no other way to describe her. She was beautiful – no stunning; she was quiet yet always had something to say; she was very strong, although she didn’t have a lot of will power when it came to sweets – which always cracked me up. I spent a lot of time with my grandmother, and I always enjoyed it – in fact, I longed to be at her house with her. She offered me advice from time to time, but like a good grandmother, mostly she just loved and supported me unconditionally. In my life, she was a strong force of stability. I have so many good memories over the years – her calming voice, her endless love of flowers (which I did not inherit), watching her play bridge with her friends or having a glass of Scotch before dinner, spending endless days at the beach then having her get the aloe plant for my very red body – it goes on and on. She was a great traveler – and was very adventurous. When most of her friends were spending their winters in Florida, she and my grandfather would go to Portugal. About 12 years ago she wanted to go to Alaska, so I told her I would go with her. We had a great week together and even went on some fun excursions – she was over 80 at the time, but that didn’t stop her. She was incredibly active most of her life – and it inspired me. I remember that my goal when I was younger was just to be able to keep up with her. I remember the day when I started walking faster than her, and it made me sad. When my daughters were born, she came out to Seattle to help – again, she was over 80 at the time. The girls loved her – and she loved them. I can still see her smile as she stared at them – even just watching them eat made her happy. Sweets were just about her only vice that I knew of – my grandfather died when I was in high school – and he was diabetic. She hid just about anything with sugar from him – and after he passed away, she was free to eat what she wanted. I never saw her go nuts, but she would tell me stories about how she couldn’t keep ice-cream in the freezer because she would eat it all. She always kept baked goods in the freezer just in case she happened to entertain – and she would wrap them tightly and in multiple layers – just another way to make it difficult for her to indulge. She was never overweight – so I had a hard time believing she really had a problem – which made it somewhat funny to think about. 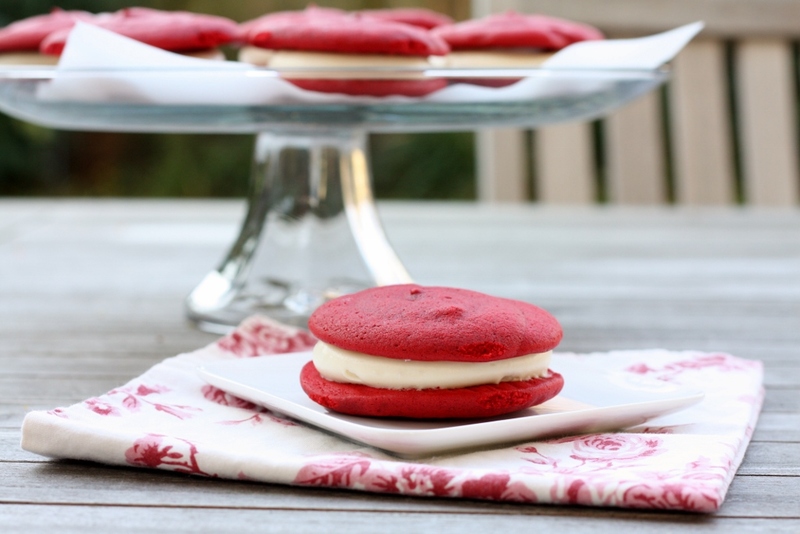 This year for my younger daughter’s birthday (which was on Thanksgiving), she had a very specific request – Red Velvet Whoopie Pies. She loves her cream cheese frosting – and she wanted to make it clear that this dessert was all birthday and not about Thanksgiving. She loved helping me find a good recipe on Annie’s Eats. I remember telling my grandmother on the phone what I was going to make for her birthday, and she wasn’t quite sure what I was talking about – once I explained them to her – she told me they sounded delicious. I know she would have loved them – but what she would have loved more was watching my daughter devour hers. When I saw my grandmother this summer, I remember I gave her an extra big hug when I said goodbye. For some reason I knew it might be the last time. Unfortunately I was right, but she was ready to go. All I could think of when I hugged her frail body is that she will always be 100% goodness. Preheat the oven to 375˚ F. Using a circular template (biscuit cutter), trace evenly spaced circles onto pieces of parchment paper sized to fit two cookie sheets. Place the parchment on the cookie sheets so that the side you have drawn on is facing down; set aside. Transfer the batter to a pastry bag fitted with a large plain round tip. Pipe the batter onto the parchment paper using the heart tracings as a guide. Bake 7-9 minutes or until the tops are set, rotating the baking sheets halfway through. Allow the cookies to cool on the baking sheets at least 10 minutes, until they can be easily transferred to a cooling rack. Repeat with any remaining batter. Allow cookies to cool completely before proceeding. To make the cream cheese frosting, in the bowl of a stand mixer fitted with the paddle attachment beat the cream cheese and butter on medium-high speed until well combined and smooth, about 2-3 minutes. Mix in the vanilla extract. Gradually beat in the confectioners’ sugar until totally incorporated, increase the speed and then beat until smooth. Transfer the frosting to a clean pastry bag fitted with a plain, round tip. Pair the cookies up by shape and size. Flip one cookie of each pair over so that the flat side is facing up. Pipe frosting onto the flat-sided cookie of each pair, leaving the edges clear. Sandwich the cookies together so the flat sides are facing each other and press gently to help the filling reach the edges. To store, refrigerate in an airtight container. After registration we were greeted with a delicious lunch from Chipotle and the highlight of the meal – ice cream from Cupcake Royale. Now, I have to admit – their cupcakes are not my favorite – but their ice cream is a different story. Wow. I tried to mini cones – coconut and red velvet – I seriously couldn’t tell you which one I liked better, they were both incredible. Dorie Greenspan was the key-note speaker, and I was blown away. What an accomplished and articulate woman, and she lives in Paris. She is my new idol. Next was what I call “speed blogging” – where we tried a bunch of different products while people tweeted and blogged about what they thought. The highlight for me was this Manuka honey – oh my. Not something I ever would have bought, but after hearing about the health benefits of the New Zealand honey bees, I am completely sold. The grand finale last night was the Gift Suite – where we put together swag bags with tons of different products. My husband and daughter had so much fun going through the bags last night – he opened at least a dozen different items, what fun! At the same time, the had tons of Seattle restaurants highlighting different dishes for us to try. Amazing. So as you can see – I am pretty much in food paradise right now, and enjoying every minute. I leave you with this very unique recipe that I found in Cooking Light. The girls were not happy when they saw those blended green tomatoes go into the batter – but what came out of the oven was completely transformed. The cupcakes were incredibly moist, and had a really nice flavor – but seriously the highlight for me was the cream cheese frosting. Oh, and don’t they look adorable? Weigh or lightly spoon flour into dry measuring cups; level with a knife. Combine flour, baking powder, baking soda, cinnamon, and 1/4 teaspoon salt in a bowl. Place sugar, oil, and eggs in a large bowl; beat with a mixer at high-speed until blended. Stir in tomato puree and orange rind. Add flour mixture to egg mixture; beat at low-speed just until combined. Stir in chopped figs and pecans. Place cream cheese in a large bowl; beat with a mixer at high-speed until smooth. Add powdered sugar, vanilla, and dash of salt; beat until smooth. Spread frosting over the top of each cupcake. 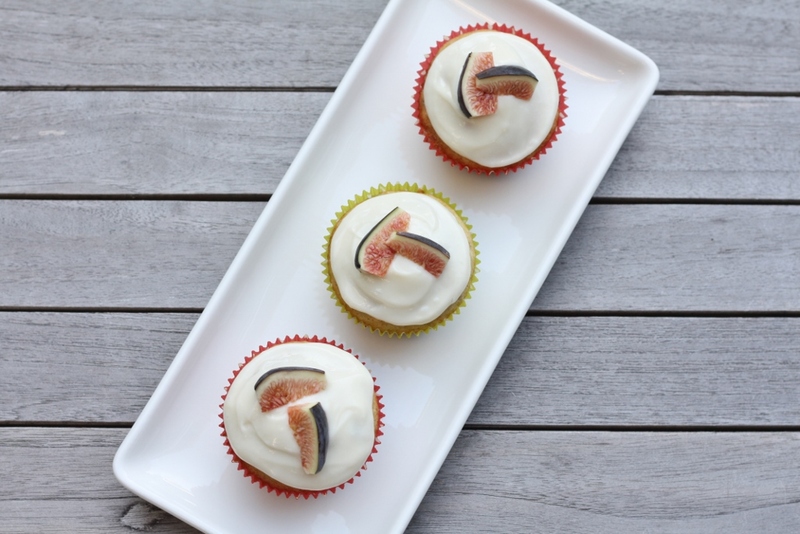 Garnish with sliced figs, if desired. Another beautiful weekend in Seattle – boy have we been spoiled this summer. And you should just see the markets. I seriously haven’t seen such amazing looking produce at the farmer’s markets in years. I walk around in awe at just about everything. This Saturday was no exception. The market was more crowded than usual – because word is getting out about how beautiful everything is – I just know it. There was so much to buy, my daughter finally had to tell me to stop, and walk around the entire market before I put anything else in my bag. I have taught her well. I remember leaving work on Friday and telling my coworkers that I was not going to work this weekend. One of them even had the audacity to suggest that I turn off my email on my phone – like that would ever happen. I told her that the anxiety I would get when I started syncing my mail again would be enough to throw me over the edge – and that I would do better just monitoring things, but reminding myself that it was time for a break. Then they asked me if I was going to cook this weekend – as I emphatically said “YES!” I explained that I had absolutely no idea what I would be making – and that it would all depend on what I found at the farmer’s market in the morning. Well, I found the mother-load. I had big plans based on what I brought back to the house – and I am pleased to report that I made everything that I wanted (ok, not exactly – I made everything I thought I could make, but believe me, that was not everything I wanted – that would take me another couple of weeks)…and everything turned out exceptionally well. What did I make? Well, I started with a couple jars of these, I made a big batch of this, and some new stuff that I can’t wait to show you. Everything was made from locally sourced produce, which makes me even happier. One of my favorites stands at the University District farmer’s market is this woman who sells her amazingly perfect apricots. They are just stunning. I get them in my hands, and I don’t want to put them down. I saw this recipe in Bon Appetit, and I immediately thought of this nice woman. Her apricot’s would make these little cakes glow. 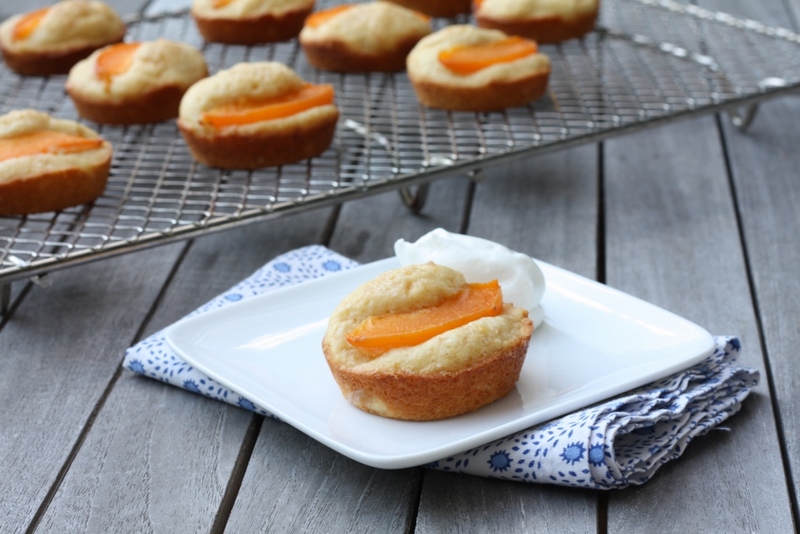 These little babies were delicious – just the perfect size, and just the right amount of golden apricot flavor. They were super easy to make – and with or without whipped cream, they were a wonderful summertime treat. I can hardly wait to see what the market will bring next week – all I know is that I am starting the week refreshed and ready to go, with my eye on the prize – next week’s market that is. Preheat oven to 350°. Coat muffin cups with nonstick spray. Whisk flour, baking powder, and salt in a medium bowl. Using an electric mixer, beat butter and sugar in another medium bowl, occasionally scraping down sides of bowl, until light and fluffy, about 2 minutes. Add egg, lemon zest, and vanilla and beat until combined. With mixer on low speed, add dry ingredients in 3 additions alternately with milk in 2 additions, beginning and ending with dry ingredients. Divide batter among muffin cups (cups will be only 1/3 full) and smooth tops. Top with apricot slices and sprinkle with raw sugar. Bake until cakes are golden and a tester inserted into the centers comes out clean, 20–25 minutes. Transfer pan to a wire rack; let pan cool 5 minutes. Transfer cakes to rack and let cool completely. DO AHEAD: Cakes can be made 1 day ahead. Store airtight at room temperature. I am tired – I actually think my body still thinks it is in Paris – that is until mealtime. Then it knows, it is no longer in that wonderful food paradise. I am also a little depressed…I am in love with a city that is thousands of miles away. And the food here is good – but nothing compares what I experienced last week. The ingredients are just better there. The farmer’s markets are overflowing right now with beautiful looking produce. Oh, and the cheese and bread, and just when you think it can’t get any better – the pastries. All those butter-rich pastries. So of course I couldn’t help but wonder…what about the people who are allergic to dairy, or allergic to gluten? Do they starve in France? Of course not – first of all, I hear there are far fewer people with allergies there because of how the food is regulated. Still – there is enough fresh food there for just about anyone to survive. My husband will do just fine there – especially since he has now successfully introduced gluten back into his diet – as well as eggs. We are now down to soy and diary – and to tell you the truth – those are actually pretty easy to stay away from. Things are looking up. It was my husband’s birthday the other weekend, and I had to make him something special. 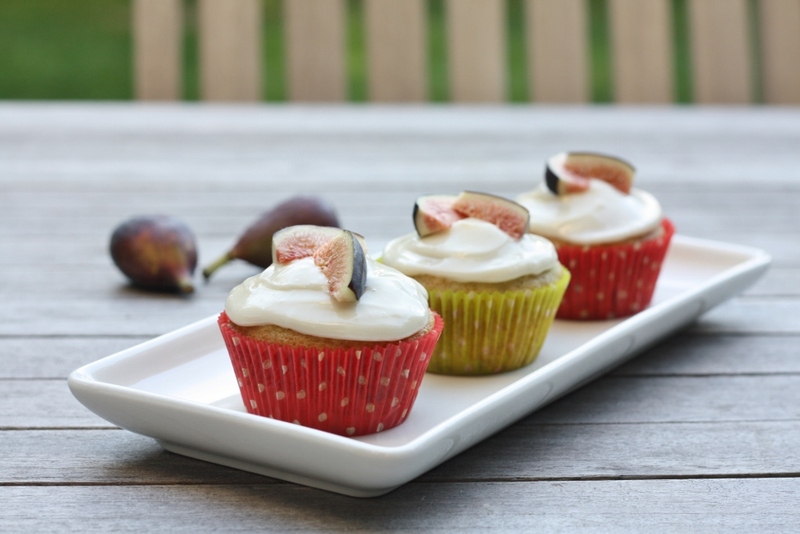 We actually discussed it for a while, and settled on these delicious dairy-free cupcakes that I have made before. Because he is not a huge marshmallow fan – I decided just to melt dark chocolate, and create a glaze. Wow – these were something else. They were intensely chocolate – almost too much for me to handle. He loved them though, and the girls had a fun time decorating. It was a win-win. Now if I could just beam myself back to Paris with my husband and two girls – then we would have a win-win-win. Preheat oven to 350°. Line a cupcake tin with papers. Whisk flour and next 4 ingredients in a large bowl. Add oil, vanilla, and 1 1/4 cups water; whisk until smooth. Fold in chopped chocolate. Scoop into cupcake wrappers, around 3/4 full; smooth top. Bake until a tester comes out clean when inserted into center, 17-20 minutes. Let cool completely in pan on a wire rack. To make the glaze, melt the bittersweet chocolate in a metal or glass bowl set over a pan of gently simmering water. Stir frequently to prevent scorching. When the chocolate is completely smooth, it’s ready. 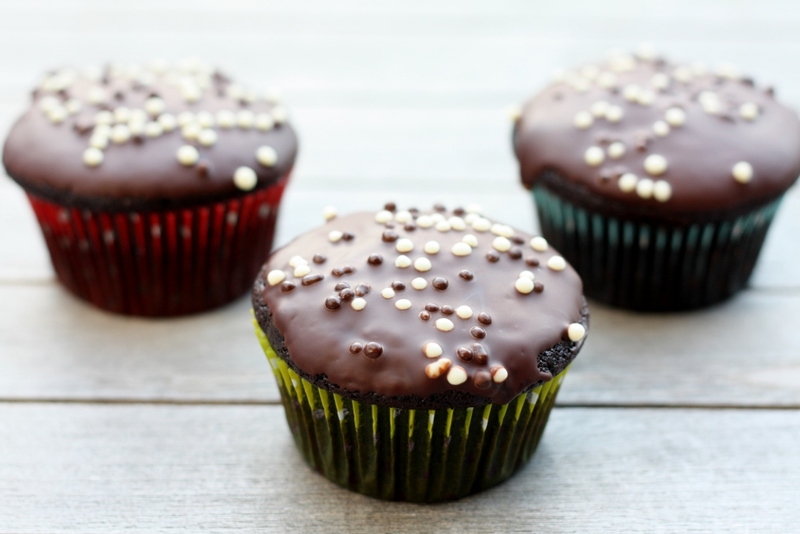 Working with one cupcake at a time, spoon a heaping teaspoonful of melted chocolate on top. Tilt and rotate the cupcake to coax the chocolate out to the edge. Alternatively, use a knife or icing spatula to spread the chocolate. The top of the cupcake should be entirely covered with a thin layer of chocolate. Spoon on more chocolate as needed. My mother and step-father flew in for her birthday, and it was a surprise for her. They showed up at her classroom with donuts on Wednesday morning, and she was beside herself. I saw a video my step-father took, and it was so adorable. That night we had a nice family birthday dinner, Friday night we went out to dinner to celebrate her birthday, and then the big birthday party was on Saturday. This was no ordinary party – this was a bunny birthday party – with live bunnies – 15 of them. Yes, you are reading this correctly – there were 15 live bunnies in my house, and they were not in a cave. Not only were there 15 bunnies, there were 14 little girls in my house, enjoying these little bunnies. 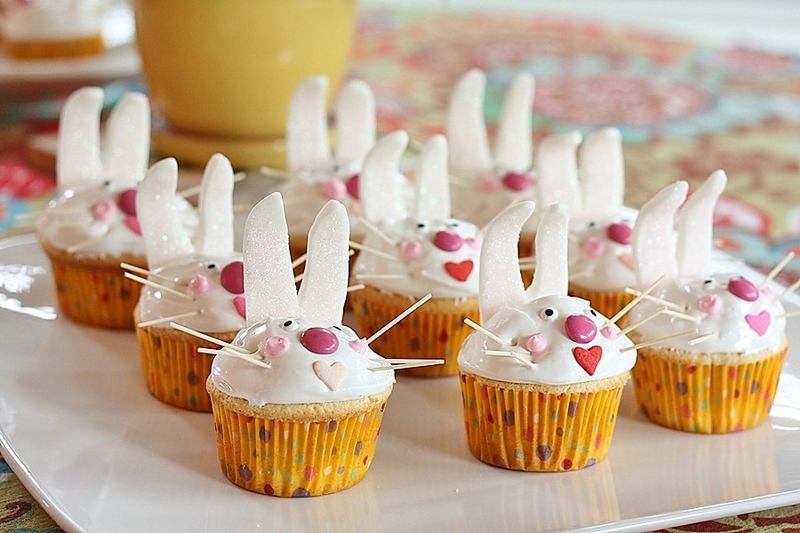 And while they were doing that, I was making these – the bunny cupcakes. It was quite chaos in my house – but I just had to go with it. It seriously took we all day today to recover from yesterday. The party was a big hit though, and the girls loved the cupcakes. Fortunately my mother made the fondant ears, and she found these adorable edible eyes – which helped me immensely. I went with the tried and true Downy Yellow Cupcakes from the Cake Bible – and my favorite Marshmallow Frosting. For the most part, the girls loved them – I did get one very noteworthy comment from one of her good friends, who reminded me that cupcakes don’t have a lot of nutritional value: There is no protein or calcium in cupcakes – yes, this is from a 7-year old. Next time, maybe I will go with some Meatloaf Cupcakes. In a large mixing bowl combine the dry ingredients and mix on low-speed for 30 seconds to blend. Add the butter and the remaining 3/4 cup milk. Mix on low-speed until the dry ingredients are moistened. Increase to medium speed (high-speed if using a hand mixer) and beat for 1 1/2 minutes to aerate and develop the cake’s structure. Scrape down the sides. Gradually add the egg mixture in 3 batches, beating for 20 seconds after each addition to incorporate the ingredients and strengthen the structure. Scrape down the sides. Fold in chocolate chips. Scoop the batter into the cupcake tins lined with papers. Fill them about 3/4 full. Bake 15 to 20 minutes or until a tester inserted near the center comes out clean and the cake springs back when pressed lightly in the center. Let the cupcakes cool in the pan on racks for 10 minutes. Bring 1 inch of water to a simmer in a medium saucepan. Combine the egg whites, sugar, corn syrup, water, and cream of tartar in a large bowl. Set the bowl over the simmering water, making sure the bottom of the bowl doesn’t touch the water. Makes about 6 cups – you will have extra. Add about 1 teaspoon of the Tylose Powder to the fondant, and knead well. This will make the fondant harden. You can test it by trying out a small piece to see if it starts to harden – depending on the humidity, you will need different amounts of powder. Roll the fondant out so it is about 1/8 inch thick, and using a bunny cookie cutter, make bunny ears. You should make sure the bottom comes to a v so it is easy to stick the ears in the cupcake. Let the bunny ears lay on a wooden spoon handle, so the ears bend a little on the top. Let them sit overnight to harden. Take your finger, and dip it into some corn syrup just inside the ears, then sprinkle some pink sugar crystals inside. Take a little bit of frosting and put a thin layer on top of the cupcakes. Take about 6-7 mini-marshmallows and put them in the center of the cupcake – this is going to help the frosting mound up in the middle. Then put frosting all around to cover the marshmallows. At this point, you can take a butter knife, and put a slit into the cupcake where you would like the ears to go. Stick the ears into the cupcake. Place two eyes, the M&M nose and heart mouth on the cupcake. Take a soba noodle and break it into 6 small equal pieces – use those for the whiskers. I put a little bit of marshmallow frosting into a small bowl and mixed in some pink food coloring and piped a little bit next to the whiskers for the bunny cheeks.